WASHINGTON: The US military has begun moving non-essential gear out of Syria but is not withdrawing troops for now, defense officials said Friday amid uncertainty over America´s planned exit from the war-battered nation. President Donald Trump last month claimed the Islamic State group had been defeated in Syria and said all US troops were "coming back now." But in the weeks since he gave the order, and the Pentagon began to implement it, Trump himself and members of his administration have delivered mixed messages about when a troop withdrawal may actually occur. Trump´s national security advisor John Bolton on Sunday announced conditions for a withdrawal that appeared to delay it indefinitely. Adding to the confusion, a military spokesman said Friday the US had already begun "the process of our deliberate withdrawal" from Syria. US defense officials moved to clarify the remark, stressing that the withdrawal was only of certain types of gear, and not troops. "We are not withdrawing troops at this stage," one US defense official said. A second US defense official told AFP that the military had conducted a number of preparations for a deliberate withdrawal. "That includes planning for the moving of people and equipment, preparation of facilities to accept retrograde equipment," the official said, noting that no troops had been withdrawn. The Syrian Observatory for Human Rights reported earlier that the US-led coalition in Syria had started scaling down its presence at Rmeilan airfield in the Hasakeh province of northeastern Syria. But the first defense official said this was merely part of a regular troop movement. 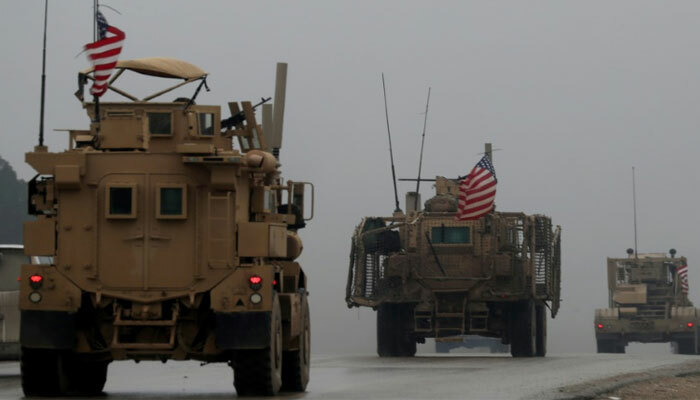 The US-led coalition has several other bases across northeastern Syria, as well as in neighboring Iraq, where Trump has said American forces will remain. The coalition, which also includes countries such as France and Britain, was formed in mid-2014 to counter IS, which had seized swathes of Iraq and Syria and proclaimed a "caliphate." Air strikes and special forces have played key roles in efforts to claw back the territory lost to IS. A Kurdish-led group, the Syrian Democratic Forces, is currently flushing the jihadists from the last pockets of land they control in the Euphrates River Valley. The battle against die-hard jihadists in remote areas along the Iraqi-Syrian border and the hunt for IS supremo Abu Bakr al-Baghdadi, the world´s most wanted man, could last indefinitely. The start of the drawdown coincided with a Middle East tour by US Secretary of State Mike Pompeo, who insisted in Cairo on Thursday that the withdrawal would go ahead despite widespread criticism. On the same day however, Pompeo said in a speech that "when America retreats, chaos often follows." Bolton´s conditions for a withdrawal included the defeat of IS in Syria and guarantees for the safety of Washington´s Kurdish allies, who have been threatened with an imminent offensive by Turkey. Turkish President Recep Tayyip Erdogan labeled Bolton´s comments unacceptable and a "grave mistake." The People´s Protection Units (YPG), which have spearheaded ground operations against IS in Syria, are an offshoot of the Kurdish PKK, which has waged an insurgency against the Turkish state since 1984. The group has already started reaching out to Damascus and its Russian sponsor. Critics of Trump´s decision, including within his own Republican party, have said a precipitous withdrawal would shatter US policy in Syria and allow IS to rebuild. They have also argued that it would further allow Syrian regime ally Iran to extend its influence across the country and potentially threaten Israel. Democratic congressman Adam Schiff, who chairs the House Intelligence Committee, blasted the withdrawal plans. "The Trump Administration´s foreign policy is as deeply flawed in its conception as it is dangerously incompetent in its execution," Schiff said on Twitter. Though Trump has said he wants a withdrawal to be coordinated, gradual and "prudent," observers have stressed that his announcement was having the same impact as a withdrawal itself. "The damage is done," said Fabrice Balanche, a geographer and Syria expert. "On the ground, the announcement of the pullout is as if they were already gone."